The other day I received mail. 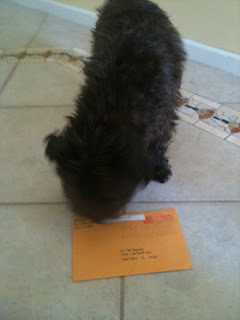 I was quite surprised to receive it because there are so many truly talented dogs in #destructogang...dogs who can tear a toy up in a matter of seconds unlike me who generally doesn't shred toys unless they are round with green furry stuff on them (tennis, anyone?). 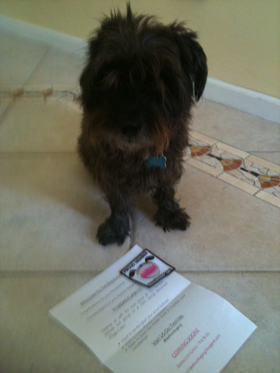 My talk about shredding tennis ball fluff was my "in" to #destructogang and I am a very proud member! Unfortunately, I have not had a tennis ball in my possession (for obvious reasons) for some time. It is true that I rarely 'destroy' a toy 'completely' and have been known to keep my toys for a very long time. I admit, I still have the VERY FIRST toy that Ma ever gave me. It's 'my baby' and I sleep with it every night in my crate. This occurs quite frequently. Everyone thinks the 'singing' or 'talking' toys will be such fun...and they are...the first time I play with them. *evil grin* They never 'sing' or 'talk' again after round one with me...the "fun" being removed by my strong terrier jaws. If I do not give the toy a terrier shakedown like with Moo-cow, I just use my jaws to crush the 'sing' or 'talk' box to smithereens. I love things that go "CRUNCH"! Once crunched...it's dead...and my work on that toy is done. I currently have four 'singing' or 'talking' toys in my toy box...none of which make the slightest of sounds anymore. I should probably pass those along to be destroyed on the outside by another member...which would make more room for new 'singing' or 'talking' toys for me to "de-bark", so to speak. Wow, how cool, I am jealous! BOL! You are very destructive. I like to kill those talking toys in about 45 seconds too. 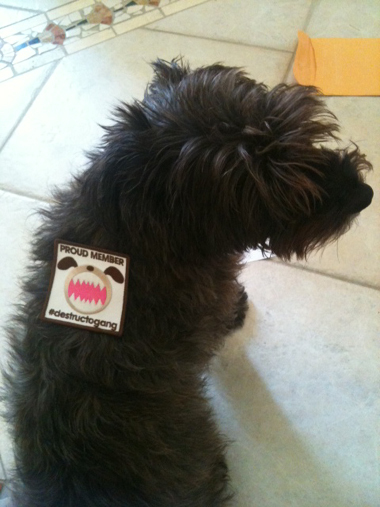 Congrats on your destructo status! The badge looks good on you! Great job on the MooCow! 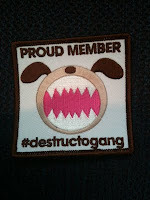 And congrats on getting into the #destructogang. Our post today is a "movie trailer" on that very subject! Come by and check it out and have a laugh! Have fun! Husky hugs from fellow destructos! 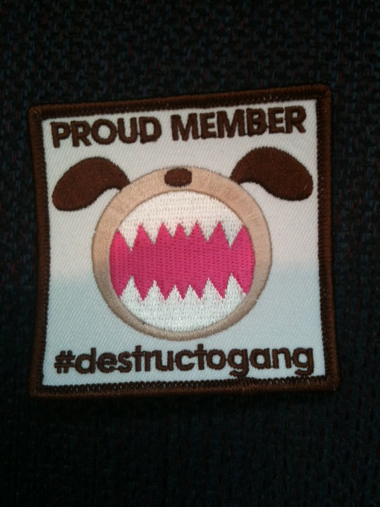 Congratulations on your membership in #destructogang! I would give that cow "what for" too - I have a piggy that oinks when it moves, and it even oinks by itself, in the middle of the night, (shudder!) - Spooky, no? Tail Wuggles, Rubie. Oskar and MeowMan: Thank you! I am still very excited about my new member 'status'! Kol and Rubie: BOL It is so fun to de-bark those toys immediately, isn't it?!? But Rubie, the one that oinks in the middle of the night...it sounds possessed. You should bury it in the backyard, face down, like a vampire! 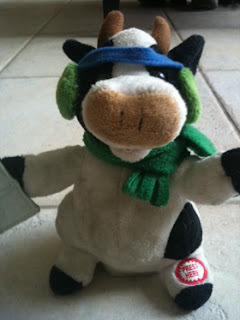 FiveSibesMom: I did pop over to your blog yesterday and saw the video. It was Pawesome!!! Millie: I shall pack up all inner-destroyed toys and send them across the pond to you for further 'inspection'! Thanks for stopping by, pals! I do appreciate it so!